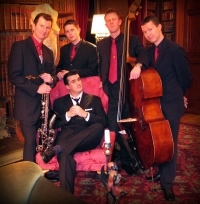 Star of the Australian swing scene Dominic Halpin erupted onto the UK music radar in 2004 and assembled his most swingin’ group yet, the Honey B’s. Dominic was dubbed the “new master of lounge” by the Sydney Morning Herald and quickly gained his reputation as “Australia’s Mr Swing” with his weekly energetic shows at Sydney’s Harbourside Casino. His albums received extensive airplay on ABC Radio and he was awarded the accolade of Best New Swing Club Act in 2002. His reputation reached as far the USA where he was invited to appear alongside Las Vegas stars for the New York Launch of the largest cruise ship in the world – the Grand Princess. Before relocating to the UK, Dominic bid farewell to Australia with a sell-out tour culminating in a show at the Rugby World Cup Final in Sydney.